A baby pygmy hippo jumps into the water for the very first time in a delightful video posted by an Australian Zoo, proving that even pygmy hippos start small. 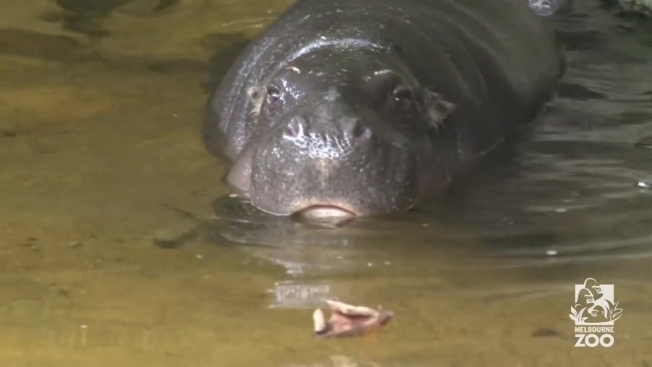 The little hippo's name is Obi, and he dives into the pool at the Melbourne Zoo with his mother, Petre, in video posted in June, when Obi was three weeks old. Quite the natural, Obi tries to hop on his mother's back and even nuzzles her snout while splashing around. "He loves the water and spends hours in the small pool," Wild Sea Manager Justin Valentine said in a Melbourne Zoo press release posted after Obi hit the waves. Pygmy hippos are found in West Africa – Obi means "heart" in Igbo, a language from Nigeria – and are much less aquatic then their larger cousins. "Its nose and ears close underwater just like a hippo's do, but its head is rounder and narrower, its neck is proportionally longer, and its eyes are not on the top of its head," according to the San Diego Zoo. Calves, like Obi, can't walk well in their first few weeks of life, according to the San Diego Zoo. But pygmy hippo mothers have a sneaky solution: tucking the calf away in bushes while she feeds.